1. What's the difference between Std and Pro? 2. What is the difference between the file-ending otf and ttf? 3. I bought an OpenType font, but the file I downloaded was TrueType! 5. I’m a german customer – where do I enter my VAT number? 6. The shop doesn’t accept my VAT number but I know it’s valid! 7. Why do I have to go through the purchase process if I'm only downloading Free fonts? 8. When I buy a typeface do I get all the point sizes? 9. Do you offer an educational discount? 1. I want to create a logo – which license do I need? 2. I want to use the font in a video – which license do I need? 3. I purchased a license for the wrong version of a font. Can I change it? 4. If I license a font, can I modify it for my own use or for resale? 5. Can I legally embed fonts into my PowerPoint, Word document, web page, or PDF file? 1. How can I extend my app license? 2. Do I need an app license to use in font in a free app? 3. Do I need additional licenses for each mobile platform that my mobile app supports? 4. Does my app license cover the release of a free update to my app? 1. How do I install my fonts? 3. I installed several styles of my font but only one font shows up in the font menu. Where did all the other fonts go? 4. My document still says the font is missing. Did I buy the wrong font? 5. How do I access the alternate glyphs in my OpenType font? 2. Will using Web Fonts increase the size of my web page? 3. I bought a font for print design, can I use it for web design? 1. How can I sign up for your Newsletter? FontShop accepts American Express, MasterCard and Visa credit cards. You also have the option of using PayPal to checkout. FontShop lists prices in four different currencies, depending on your region. Austrian, German and Swiss customers may purchase paying by invoice if the total amount is less than 500 Euro. We cannot offer any tax excemption for german customers, this is why the field for the VAT number does not appear when you are logged in as german customer. We are connected to an EU service that compares the address data in your user account and your VAT registration in order to verify the VAT number. So both addresses have to match exactly, otherwise your VAT number will not be accepted. You need to create a FontShop account and send us an email - please also send your student ID or other document along that proves you are educator. We will assign the discount to that particular account then. Different manufacturers have different policies regarding font embedding. Most fonts can be embedded for print and preview purposes only. You can refer to the End User License Agreement (EULA) that came with the font software for specific information about embedding. If you are planning on embedding a font, you may wish to familiarize yourself with the policies surrounding that particular font. The EULA for every font is linked at the bottom of the font's family page. If your app downloads exceed the number of licensed installations then you can easily purchase additional licenses. No. The license will support any mobile platform that your app is available on. This includes iOS, Android, and Windows mobile devices. Yes. If you licensed an app and did not charge your customers for the update then you do not need another license. We at Fontshop recommend using the OpenType font format. Among the major advantages of this format is that it provides for compatibility between Mac and Windows and allows up to 65,000 characters per font to be embedded. Please note that our Fontshop downloads only support users of the most recent operating systems and application versions. If you are using an older system, you will probably need to install additional software, such as FontExplorer® X Pro, or you will not be able to access all font features. All font files that you download from Fontshop will be in compressed form. Before installing them, you will need to unzip them. For this purpose, just double-click on the .zip file. We recommend that you save the extracted font file to your Desktop. If you have difficulties extracting your file, you will need (free) utility software, such as wie WinZip® and StuffItExpander®, to help you unzip your file. You can locate your font management program in Finder under “Programs”. Double-click on the name or icon to start the program. Click on the gear icon in the upper right corner of the font management window. 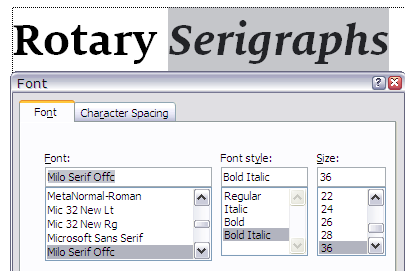 Select the option “Add fonts”. This opens another pop-up window. Locate your unzipped font file and then click on “Open”. Your new font will now be available to your system. Fontshop recommends use of FontExplorer® X Pro – the professional and easy-to-use font management software. All font files that you download from Fontshop will be in compressed form. Before installing them, you will need to unzip them. For this purpose, just double-click on the .zip file. If this does not work, click on “Unzip all files” on the right hand side of the menu. We recommend that you save the extracted font file to your Desktop. If you have difficulties extracting your file, you will need (free) utility software, such as wie z.B. WinZip® and StuffItExpander®, to help you unzip your file. Use copy and paste to add your unzipped font file to your fonts. First, locate your unzipped font file, mark and copy it. Click on this to open it. 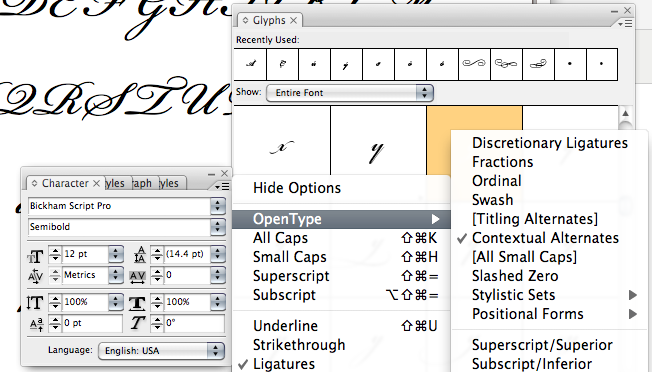 Now click on “Edit” and “Paste” from the top bar to add the copied file to your font collection. Do you want to manage, activate and organise your fonts professionally, but simply? Then we recommend FontExplorer X Pro, either for Mac or Windows. If you work on a Mac, you’re probably familiar with the default font management application, FontBook. 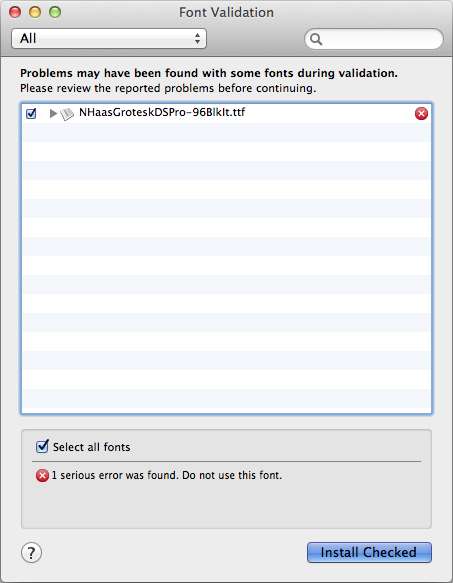 Sometimes, a “Font Validation” window will pop-up when trying to install your newly licensed font — don’t panic. There is nothing actually wrong with your font file even if you find errors listed such as issues with “kern table structure and contents”. Our suggestion? Go ahead and select the font when the Font Validation window pops up and install the font; your font will still work properly within the programs you intend to use them in. The software is just acting overly cautious with the font files — the same font files will install successfully on Windows without a validation error as Windows does not have a default font management application like FontBook. If you’re still unsure about it, you can send our Sales & Support team an email [email protected] and we can install and test the fonts from your order for you before you commit to ignoring the Font Validation window. One such common case of this is with Helvetica. A document may call for "Helvetica-Bold". You then purchase Helvetica Bold, install it, and open up the document, only to be alerted to a missing font. This is because Fontshop's version of Helvetica will actually have the name "HelveticaLT-Bold", to signify that it is a Fontshop font. A version without the LT in the name is likely from Adobe, which sub-licensed Helvetica for distribution long ago. Many OpenType fonts have advanced features and alternate glyphs that lend to greater typographic usability. The way in which these features and glyphs are accessed depends upon the application that you are using. Most professional design applications, such as those in Adobe Creative Suite, have OpenType menus that allow the user to activate the features relevant to the selected font. Some applications do not yet have full support for OpenType fonts. While they will work on a basic level in almost any application on both Mac OS X and Windows, many of the features and alternate glyphs may not be accessible. Microsoft Office is the most notable of these. In a font like Bickham Script Pro, for example, you will not be able to access the swashes, ligatures, and contextual alternates that are included in the font. Yes. Similar to adding a photo, you site will increase in size and because of this we normally recommend keeping your web font selection on the conservative side. You typically don’t need an entire super family. When creating the webkit, you have the possibility to minimise the file size by choosing different languages and/or OT Features. For Monotype IP (including FontFonts) you can subset your fonts even more via our subsetter. Sign up for 'Letternews' is available on our News page.